Custom Logo Chairs and Stools for your team! 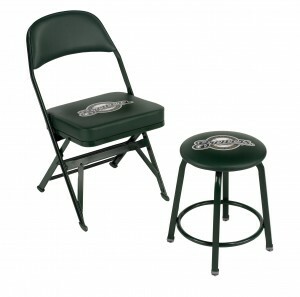 If your team needs new sideline chairs, or locker room chairs and stools, you’ve come to the right place at Athletic Seating. We specialize in logo seating for schools, and unlike all the other chair dealers you’ll find, we’re the only one that does the custom logo printing ourselves! All the other chair dealers are just middlemen between your school and the chair manufacturer. They do nothing except shuffle paperwork for your project, and then charge you for their “efforts”. Here at Athletic Seating, we take your supplied artwork or team logo, clean it up, and type if needed, create proofs, then do the actual printing ourselves. Your finished, printed vinyl logos never leave our sight or our building! we are in complete control of your project, and never have to worry about how the finished chairs or stools look. And, thats how we keep cost down for you. No middlemen mark-ups or unexpected extra charges that other dealers have to worry about. Don’t believe us? Get a quote from them and ask if they have any part in your custom chair production, then give us a call.